* 'Festivals of India' (India. Ministry of Information and Broadcasting, India (Republic). Ministry of Transport. Tourist Division - 1956). People in Nepal have a somewhat similar ritual. 1. 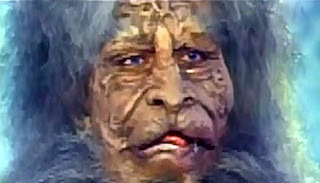 A screen cap from Yeti film from Ramsay Brothers' Ajooba Kudrat Ka (1991). Yech always reminded me of Yetis. 2. Photograph of Ladakhis by John Burke. Notice the cap and the dress. Great insight on the ritual. For some reason, I couldn't understand the point implied in second image. Can you elaborate on this? As a kid I always imagined Yech as a furry creature with a fur cap. That dress in the pic looked interesting.